As the Holy Father celebrates 5 years of his Papacy, we’re going to preview the trailer of your new film: “Pope Francis – A Man of His Word”. What does this film mean to you? How did the film come to be, and what do you expect? WW: Not in my wildest dreams would I have expected to make a film about Pope Francis. 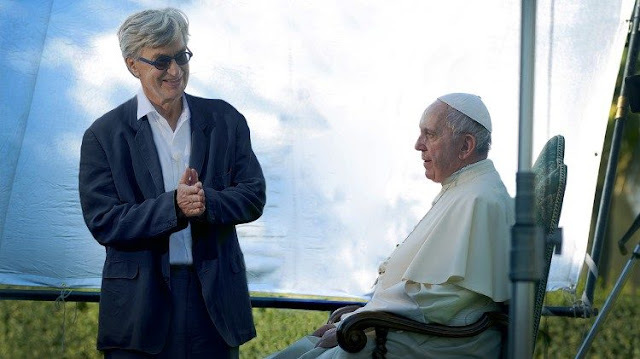 When I got the letter with an invitation to come to the Vatican and discuss with Don Dario Viganó the possibility of a film about the Pope, I first took a deep breath, and then I walked around the block. It seemed that such a project would represent a huge responsibility, at least it would be a whole different kind of task than any film I had made before. But of course I would go and find out what Don Dario had in mind. It turned out that he offered me Carte Blanche, let me write a concept and define myself the film I could imagine. And the Vatican would not interfere, and would open its archive for us. I said yes. Of course. It needed a while for my concept to take shape, for the financing to fall into place and for the first shoot with Pope Francis to be organized. From that first interview to the finished film it took almost 2 years, 3 more long interview sessions and a shoot in Assisi, the home town of Saint Francis. And months and months in the editing room, until the film had taken its final shape. And it fulfilled the high hopes I had for it: that it would allow Pope Francis to speak directly to every viewer and listener, almost face to face, about all his concerns and all the issues that matter to him. This wasn’t meant to be a film about him, but with him. The Pope was involved in the shooting… Did anything happen on the film set that has particularly impressed you? WW: Oh yes! Each time, I was very impressed how open Pope Francis was to each question, and how directly and spontaneously he answered. And after each of our four long sessions, he took time to shake everybody’s hands, and did not make any difference between producer or director or electrician or assistant. You once said the Pope “is a true example of a man who lives what he preaches”. What well-wishes do you have for him today? WW: I had the highest regard for Pope Francis before I ever met him, just from seeing him on television and from reading his sermons or his encyclicals. But meeting him eye to eye, and then also seeing and hearing him every day in the editing room, not only in our own interviews, but also his many talks all over the world, to refugees, prisoners, politicians, scientists, children, rich or poor or regular people, made me realize how courageous he was, how fearless. And that would be my wish: that he never loses that relentless courage.